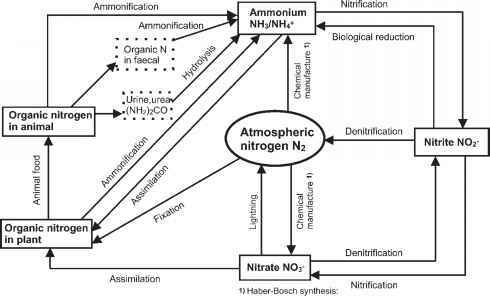 Substrate removal is only influenced by sludge age tRX, which replaces the three parameters tR, nR and nE. We see here the importance of the parameter "sludge age", which will be used more and more not only in theoretical considerations but also in the practice of activated sludge system control. Fig. 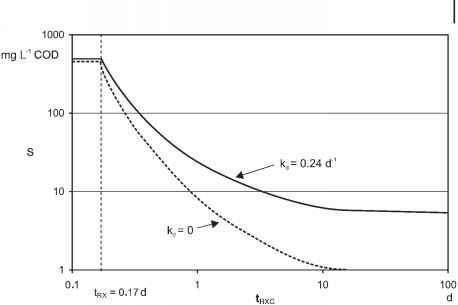 6.4 Effluent COD concentration of a CSTR versus sludge age tRX; with bacterial decay (kd = 0.24 d-1} and without bacterial decay (kd = 0 d-1} for a one-stage CSTR; ^max = 7.2 d-1, KS = 100 mg L-1 COD; S0 = 500 mg L-1 COD. follows, the same relationship as calculated for tRtRX. After this model with tRX was presented as the only process parameter in the early 1970s, it was published, discussed and applied very frequently (Sunstrom and Klei 1979; Benefield and Randall 1980; Winkler 1981; Nasaroff and Alvarez-Cohen 2001). Figure 6.4 presents some theoretical results which were calculated for pmax=7.2 d-1, KS=100 mg L-1 COD, kd = 0.24 d-1 and S0 = 500 mg L-1 COD. The difference of dissolved O2 in the influent and effluent water is neglected. We want to continue the calculation of activated sludge plants in Chapter 11.